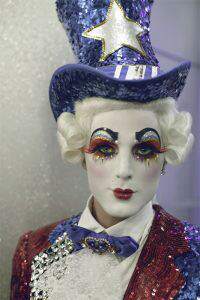 Described by pop culture and style journalist Rose Apodaca as a “rock star in Rococo France,” roguish operatic dandy Prince Poppycock‟s glittering reign commenced in 2006. Witty and glamorous, with a powerful trained voice, Prince Poppycock has opened for bands like the Dresden Dolls and The Sounds. In his teenage years he developed a love for writing music and became “enamored” with David Bowie, Depeche Mode, opera, madrigals, Gregorian chant, the Smiths and Gilbert and Sullivan. He joined Chicago synth-pop band Endora as lead singer and songwriter. Prince Poppycock specializes in musical theater and opera. Poppycock came to national attention in 2010 when he competed on the fifth season of America’s Got Talent. On September 15, 2010, he was voted fourth place in the final four. Susan Jones brings her 20 years of comedy and radio experience to the stage with some seriously funny girl talk. 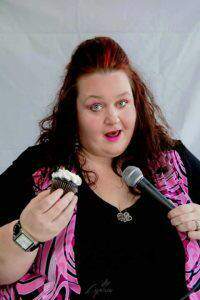 Larger than life, Susan uses her attitude and experiences with size acceptance and being a single mom to deliver consistently funny, crowd pleasing performances. Get your Prince Poppycock w/ Susan Jones tickets here now!